By all accounts Uncle Horatio was an odd man. He never married mainly because of his passion for raising birds. Every spring he would walk around in the forest after thunderstorms to see if any nestlings had fallen from their nests above in the trees. If he couldn’t return the baby birds or find the nest, he would put the young birds safely in his bird and raise them. He did this every year. This piece is on Ebay if you want to make it yours. I knew someone once that okay, confession time, I got to the point I would piss her off just to see her stink eye. I was watching this amazing argument on Facebook with two people arguing over which of them heard Techno music first. 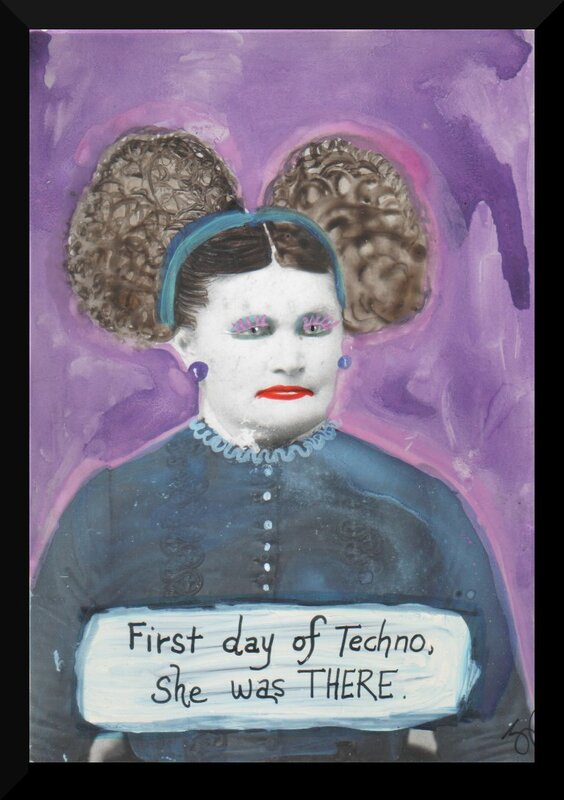 I beg to differ, everyone knows it was this woman, first day of techno – she was there! True love sees past all our dents and dings as humans. We see the inner person we love not what’s on the outside. This started as a blob of pink paint on a piece of watercolor paper. I found it after it dried. So i drew a circle around it, then I decided it was a pink pearl that a little fishy was holding in his fish teeth. And then I thought, wouldn’t it be great if the pearl belonged to his best friend, a mermaid? I love painting mermaids, especially drawing the scales on the tail – that is super fun to me (yeah I know, I’m weird). I think it was also inspired because the fish tank on the second floor leaked and my side of the bed (of course) is wet – I think I”ll have to camp out on the couch in the living room tonight until it’s dry. This will make a great addition to your collection of our art – bid now! Ink, watercolor on 140lb cold pressed paper. New Art for March 1st! You Need Six Copies of This Book! Tales from Nebrahoma is out!